"I just finished reading this book. It is very well-written. I am re-reading it because there is so much to absorb. I too am disturbed about the state of education and this book really does talk about the system from the inside and what has gone so terribly wrong in our schools and school systems, public, private and independent. 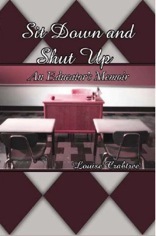 This book must be read by teachers and those at the top of the educational structures. As dissatisfaction with the mess of education grows it is great to read about the slow decline from an insider who had to watch the rot over nearly forty years. Yet, this book approaches education with humor and positive suggestions for correcting a system which is so obviously broken. The book is a fun ride through recent American history as well, written by an author who is a grand storyteller and can place the reader into the scene where one can visualize the story as it unfolds.